"Radio and Literature Department", that is the name given to the present Communication Department at birth or when it started. Discussions on creating the unit probably started in the early sixties and the groundwork laid between 1966 and 1967. In 1968, effective work started in the Department with the objective of evangelization through radio. Radio at the time meant producing programmes and boadcasting them on the government radio station in Buea. The Literature dimension of the Department focused on the production of the "Messenger", a 16 page black and white magazine that published both Christian and general news items. It is not certain whether or not the Diary and Almanac was part of the literature work at the time. The three radio programmes broadcast included Presbyterian Meditation every Sunday and holy days, the news programme, Presbyterian Echo, broadcast on Thursdays and Morning Devotion from Mondays to Saturdays alternating with the Baptists and the Roman Catholics. In the course of time, those working in the Department thought the name "Radio and Literature" was respective. Consequently, the first Cameroonian Secretary of the Department, the Rev. Nyansako-ni-Nku proposed to the Synod Committee meeting in Wum and it was agreed that the name be changed from Radio and Literature Department to a more comprehensive name, "Communication Department". The change of name was thus effected in 1972 with the understanding that the new name covers a wide panorama of both the print and electronic media. With the new appelation, the Department could include print items such as newspapers, magazine, gospel tracks, diaries, almanacs and more. And in the electronic side it could have radio, audio and video productions, computers and other information technology infrastructure as well as television. From the year of its inception, the Radio and Literature Department turned Communication Department grew amidst problems of personnel and finances. The few trained and untrained staff worked together. While the magazine died and resurrected a number of times, the number of radio programmes increased from three to four and then to five, with "Our Choirs Sing" and "Days of our Life" being the new additions. At the moment, the Communication Department has grown and expanded beyond Buea. A branch was opened in Yaounde and functioned for about two years, before it was halted due to staffing and infrastructure difficukties. The Church still hopes to reactivate the Yaounde Branch Office in the years to come. Meanwhile the Bamenda Bureau whos rudimentary stage goes back to 1983 and 1984, started effectively in 1985 when Rev. Achowah Umenei set the firm foundation and worked in the office for five years, 1985-1989 before his transfer to Buea. The Office is officially known as the Communication Department North West Province. It has a Recording Studio and produces programmes for broadcast over two Radio Stations. 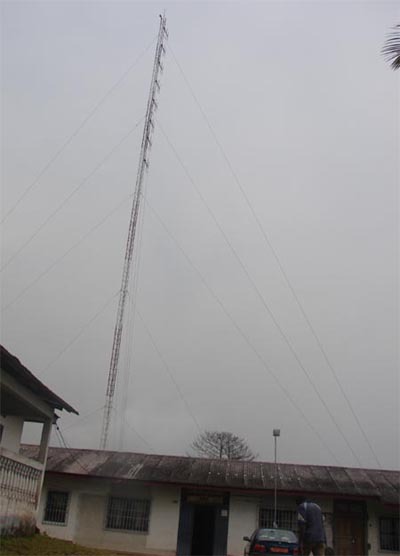 The Branch produces five programmes over the government radio station - CRTV Bamenda and three programmes over a private radio station in Mankon Town on the road to Bali, known as Radio Hot Cocoa. The Officer in charge is known and called Communication Officer North West Province. Some Christians feel that the appellation is not in consonance with similar offices in the Church. They say the position ought to be called Provincial Communication Secretary as you have Provincial Secretary Women's Work and Provincial Secretary Men's Work. That school of thought also holds that the head of the Department should be called the Director of Communication or National Communication Secretary. The main work of the Communication Department is done in the headquarters in Buea where it all started in 1968. What goes on in the Department can be classified under four main sections, namely: Radio, Print, Seminars and Public Relations. Radio work is the taproot of the Presbyterian Communication Department. Since the Department now has a full-fledged Radio Station, we shall come to it later. The Print section of Department produces an annual Church Almanac with the purpose of showing the Presbyterian Church in Cameroon in action. Every year, it recieves a variety of photos from the grassroots that is, from congregations, Departments and Institutions, selects them and compose an Almanac that reflects the activities of the Church. Sometimes, certain units of the Church and Presbyteries do not send in photographs, as a result, what goes on in the areas is not reflected in the Almanac. About 5,000 copies of the Almanac or the Church in photos, go out for sale throughout the Church's territory. In addition to the Almanac, the Department produces the Daily Bible Readings and Diary. This publication carries the PCC lexionary for the whole year, has all the addresses of the PCC Departments and Institutions, names and telephone numbers of pastors and their parishes as well as other useful information. Some Christians have called the Diary, the "eycyclopedia" of the Presbyterian Church in Cameroon. The Diary is a very useful spiritual tool. The Department produces between 20,000 and 30,000 copies annually and they are sold to all Christians, irrespective of denomination. It is the most popular publication of the Presbyterian Church in Cameroon and at one time was used by the Presbyterian Church of Sudan. The "Presbyterian Messenger" is another major print item from the Presbyterian Communication Department. The quarterly magazinereports the activities of the PCC and the Church across the world. Not all the four issues come out every year due to personnel problems and the poor reading culture of Chrisians and the Cameroon public in general. The colored magazine is subsidized by the Church to sell at 500 francs a copy, yet find piles of unsold copies in the offices of some Treasurers who serve as sales Agents and in the Communication Department. The last Synod (If this paragraph really has to be published, which is the last Synod?? ?, specify date) took a decision making it mandatory for all Departments, Institutions and Presbyteries to sell all the copies they recieve. In other words, a refund of unsold copies is unacceptable. Less than 3,000 copies go out for sale in each edition. Radio is the foremost preocupation of the Presbyterian Communication Department. When the Department started 39 years ago (1968-2007), the workers wrote their scripts in the office and took them to Radio Buea for recording and broadcast. In 1978, the Department installed a professional Recording Studio and could record its programmes and inly carry the tape to Radio Buea for transmission. As that went on, plans were affot to open and operate a Church Radio Station. The idea ran into gear 5 when the Cameroon government ceased having a monopoly over the airwaves, giving room for private radio stations to open and operate across the country. The Church availed herself of the opportunity and started the Christian Broadcasating Service (CBS) Radio FM 95.3. The test signals went on the air on Saturday February 21, 2004, and on February 26, 2006, the Moderator of the Presbyterian Church in Cameroon- the Rt Rev. Dr. Nyansako-ni-Nku dedicated the Station to the glory of God and the service of His people. The Station produces bothe Christian and public afairs programmes and the signals cover the whole of Fako Division, parts of Meme and Kupe Manenguba Division, the Litoral Province and a section of Equatorial Guinea. We have a very dynamic and participatory audience in the catchment area. Besides, CBS is one of the most popular Stations among the six government and private Radio Stations in the Buea Municipality. It broadcasts in English, French and Pidgin English and will eventually have some programmes broadcast in Cameroo national languages. The Radio Station works in two shifts. The morning shift goes from 5:30 am to 12:00 noon. While the evening shift begins at 5:30 pm and ends at 10:30 pm. Listeners have expressed the wish for the Station to go 24 hours, but management is traveling gradually and may eventually go 365 dasy a year. When that hapens is not yet worked out. Caution is taken in order not to start things in a haste and not carry them through effectively. Meanwhile, CBS Radio FM 95.3 produces about 60 programmes every week. This is due to the commendable effort of 53 volunteers called Voluntary External Broadcasters (VEBS) who produce and present programmes at the Station. Not being professionals, they make mistakes but the stationis indebted to them for its current performance. The Church had no professional communicator at the time the Synod decided to create the Communication Department. Consequently, the first Cameroonian to lay the groundwork was a pastor with a teacher's educational background, one of the best the Church had at the time - the late Rev. Pastor Moses Fondo. He combined the work of Parish Pastor of Victoria, now Down Beach Limbe with that of Secondary Radio and Liteature Department. The Rev. Martin Fust, a Swiss missionary and Parish Pator of Buea Station also did some part time work in the Department. Later, a trained communicator from Germany, the Rev. Siegart Kappus came to serve as the first Secretary of the Communication Department. Young Pastor Nyansako-ni-Nku from the Theological College Nyassoso, after a few months in Kumbo, Bui Division as Parish Pastor, was reassigned to work with the Rev. Kappus in Buea in 1970. He was the first Cameroonian to work full time in the Department. After prelimiranary communication training in Nairobi Kenya, the pastor eventually succeeded his boss in 1972 and became the first Cameroonian to serve as the Communication Secretary. That same year, another fresh graduate from the Theological College Nyasoso - Pastor Joe Set Aji-Mvo was posted to the Department. In 1974, when the Rev. Nku left for the United States for professional studies in communication, another German, a lay professional communicator, was appointed Acting Communication Secretary. As Mr. Burkhart Vietzke was entering the Department, the Rev. Joe Set Aji Mvo was moving out to the Youth Department and Pastor Victor Wan Tata coming in to replace him. The Rev. Nyansoko-ni-Nku returned from the United States in 1976 to resume the office of Communication Secretary. The next year, the Rev. Victor Wan Tata also left for America, making way for Pastor Achowah Umenei to start work in the Department. While the Secretary remained in office till 1989, the rapid succession of the second pastor in the Department went through the Rev. Achowah Umenei, Edward Lekunze and Ikome Samuel Mbela. Buea has inadequate staff given the volume of work it has to carry out. Consequently, part of the work suffers. Examples include, the in ability to produce for editions of "The Messenger" a year. The Radio is a full service in its own right and expected to have a separate budget from the Department, but that is not yet the case. Financial constraints are a major obstacle. There is acute need to organize a communication seminar for VEBS to enable them be more effective in their programme production and presentation. Field programmes cause staff to travel to distant places on bad roads that need a four wheel drive vehicle. Unfortunately, the Department lacks such a means of movement. The Department and the Radio Station share one building, the old Synod Office building. That creates problems of space and accommodation. The ideal situation is to build a new Broadcasting House separate from the office building.Even the Old building needs renovation. For purpose of security, the entire building ought to be fenced. Thank God the fence is in progress. The Bamenda Station also needs a four wheel drive vehicle, a computer, CD Player and audio cassette duplicator. Both Buea and Bamenda lack new tape recorders and video cameras for coverage. CBS Radio needs a machine that can burn CDs. The Presbyterian Church operates in 23 Presbyteries, 21 in English-speaking and two in the French-speaking part of Cameroon. The Presbyteries cover eight of the 10 Provinces of the country. That vast area makes it imperative for the Church to reinstate the Communication Department East Mungo with headquarters in Yaounde, the capital of Cameroon. The Communication Secretary reminds the Committee of the Ministry every year through his annual report to re-establish the Yaounde unit. CBS does not cover all the Presbyteries of the Church. That implies building another Radio Station for the North West Province that plays host to 11 of the 23 Presbyteries of the PCC. The other alternative is to increase the power of the transmitters in Buea and construct relay stations that will enable the signals from Buea to cover the whole Country. The Radio Station is using analogue machines and that is old fashioned. The radio world is going digital, so CBS Radio FM 95.3 needs brand new digital equipment to evolve with modern Technological advances. It would be good to link the Radio Station to the Internet to allow Cameroonians abroad to listen to CBS programmes on their computers. In the communication scenario, the sky is the limit, so the Church could open and operate a television station in the years to come. For over four years now, the Communication Department has been seeking the assistance of experts to build a website for the Church. This dream is gradually coming true because one of ours has kick started this long awaited website. The Presbyterian Communication Department is a veritable instument of evangelization for the Church. Besides its functions, stated above, it carries out public realtions duties on behalf of the Presbyterian Church in Cameroon. With the advent of the Radio Station, the Church has a landmark instrument for evangelization, information, entertainment and education of the public so that Cameroon grows and receives the life in abundance that Jesus intended. For that to happen, the Department needs more trained personnel, additional finances and material resources. Such resources from within and without the country would enhance the PCC communication ministry and empower it to work better to the glory of God and the service of His people.